Thought that he would be interested in the attached article from Forbes magazine. The article is titled "Rent shokku" by Neil Weinberg published June 7,1993. Please note that the attached article is not digitized. 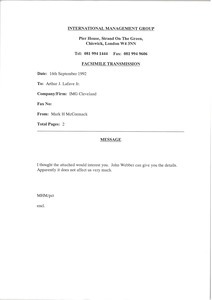 McCormack sends an article from an unknown source regarding Edinburgh, Scotland bank Adam and Company being saved from collapse by a shareholder. Enclosure not scanned.